It was a cloudy and cold morning in Rocky Mountain National Park. Fresh snow had fallen the night before and continued to fall as dawn approached. I headed up Trail Ridge Road to the Many Parks Curve overlook to see if there was any chance of the sun peaking through at sunrise. 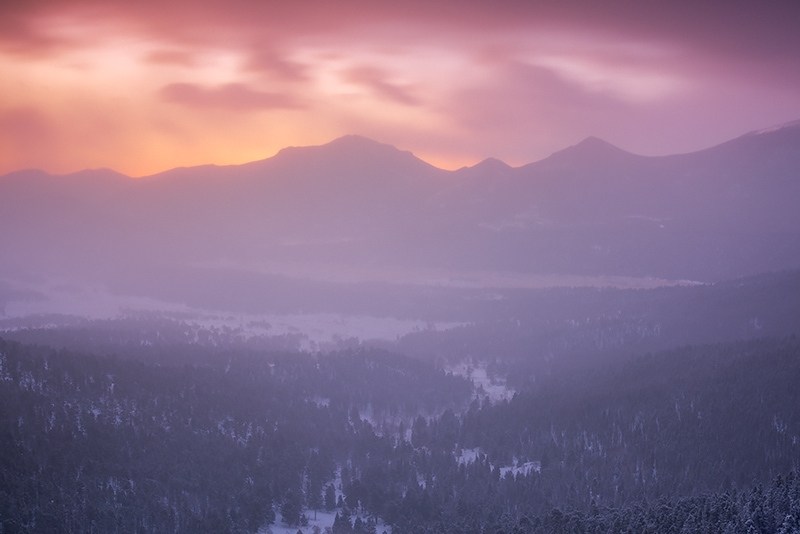 I was snowing hard when I arrived, but I setup my camera anyway and stood in the cold peering to the east. Right as the sun rose, the snow squalls momentairly parted and revealed this beautiful view of Upper Beaver Meadows and Moraine Park. Snow was falling over Upper Beaver Meadows and Moraine Park but there was enough visability to make a few exposures before the snow closed back in and again obscured the view. Photo © copyright by Thomas Mangan.